I wasn't sure what to write today ... so I scrolled through my personal Facebook page to find my inspiration. One of my Fort Meade neighbors posted a video from NONE MORE AMERICAN: ARMY FOOTBALL IN POST 9/11 AMERICA - check out this clip. Then I'll rise and fight again. During the summer of 2007, my neighbor asked me to help her coordinate activities for two children of an injured soldier - his family would be relocating from Fort Riley, KS to Washington, DC, during his recovery at Walter Reed Army Hospital. My neighbor and I raised the funds for several sports camps for the soldier's two children. Our rationale was if the family was busy, then the soldier could focus on his own recovery. 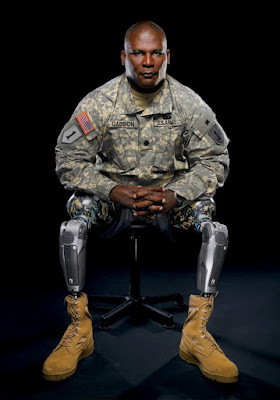 My children, in elementary school at the time, met the soldier - Greg Gadson - at my neighbor's house; he walked using his hands. It did not phase them. They were more interested in his service dog. Gadson played outside linebacker at West Point. In the summer of 1985, he met Mike Sullivan, a defensive back. Fast-forward 22 years later to when Sullivan was the receivers coach for Giants coach Tom Coughlin. Sullivan had lost track of Gadson, who served in the Gulf War, the Balkans and Afghanistan, but heard about his injuries through former Army teammates. Sullivan visited Gadson at Walter Reed, bringing with him a Giants jersey with Gadson's name and the No. 98 he wore at Army. On departing, Sullivan asked whether there was anything else he could. "Well," Gadson said, "when you guys come to town, I would love to see you play." As it turned out, the 0-2 Giants needed Gadson more than he needed them. 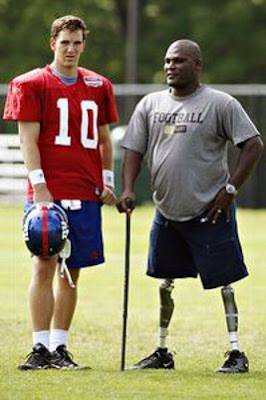 On the Saturday before the Sept. 23 game with the Washington Redskins, Gadson was invited by Coughlin to address the team. "I just spoke from the heart, as a soldier and a former football player," Gadson explained. "I talked to them about appreciating the opportunities in their lives, how special and privileged they were." The Giants trailed 17-3 at the half, and their season seemed over. But New York rallied to score three unanswered touchdowns in the second half and, with a rousing last-minute stop after the Redskins had a first-and-goal at the 1-yard line, escaped with a 24-17 victory. It was the turning point of a championship season, and, as it unfolded, the Giants acknowledged their debt to the lieutenant colonel who inspired them. The Giants won the Super Bowl for the 2007/2008 season with Greg on the sidelines. That's ten months from a road side bomb in Iraq to being a special guest at the Super Bowl. 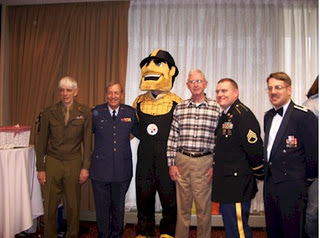 During the 2008 RT Booklovers' Convention in Pittsburgh, I hosted the SOS Military Tribute. Fabio made a special appearance (you can see his hair over my husband's shoulder, right). George Small, spouse of beloved author Bertrice Small, attended in his original WWII uniform (left, he landed on Omaha Beach). A soldier's mother shared how making quilts for injured soldiers helped with her own grief for her son who made the ultimate sacrifice - there wasn't a dry eye in the room. I also invited the Steelers to send a representative to the tribute - their mascot, Steely McBeam, came to cheer us on (middle). Steely happened to be a Navy Veteran. It seemed appropriate that I share the story of how I helped the Giants win the Super Bowl: I helped Greg's kids; he was then focused on recovery; he inspired the Giants out of their 0-2 slump; the Giants won the Super Bowl. Guess who won the Super Bowl the next year? The Steelers ... maybe it was my connection to Steely McBeam. Four years later, in 2012, I was sitting in the movie theater on Pearl Harbor, watching BATTLESHIP - enter Greg Gadson as wounded warrior Mick Canales who is ensnared in the alien invasion of Oahu. He tells his physcial therapist, Sam, "Let see if we can buy the earth another day". I watch that movie EVERY time it is broadcast on FX ... Greg reminds me that we may be down, but we are never out. I hope you find inspiration this weekend. This is the most uplifting thing I've read in days! What a beautiful story of service, sacrifice and fellowship. I've never seen "Battleship," but will find it on Netflix for our next fairlife movie night. I can say, "I know something neat about one of the actors," and share this. Plus, it's from a year the Steelers won the Super Bowl, so that's icing on the cake! An inspiring post thank you. Kim, do you think you can invite the Chicago Bear's mascot so we might have a decent season next year! My daughter is an amputee and the men and women of the military have helped her in ways they never thought about. Prosthetic devises have improved tremendously ans she has benefited. The role model they provide allows her to keep going as well. In high school she played varsity basketball. She is an amazing young lady now. This is a phenomenal and wonderful post! I love that you have met Mr. Gadson. I remember him in Battleship! What a wonderful post. The Steelers could have used your help again this year lol. Somehow we always get thru things, maybe they don't turn out how we wished or even imagined, but eventually things do get better again. Such an inspiring post. Thank you for posting. I'll have to check out Battleship.